OVH, a global leader in cloud infrastructure has announced it has started operations and seen strong growth since it opened its first Indian office, earlier this year. With business in North America, EMEA and APAC, OVH has drawn on its international expertise to offer a different vision of the cloud for its growing customer base in India. Founded in 1999, today OVH maintains 28 data centres in 12 locations across four continents. OVH deploys its own global fibre optic network and manages the entire supply chain for web hosting, making it easier for companies of all sizes to access the cloud. Since its operations in India began in June 2018, the company has seen great momentum with customers across the country signing up to it dedicated servers, web hosting, private and public cloud services. Today OVH is launching the Digital Launch Pad in India to support emerging businesses in the digital arena and allow them to benefit from reliable and flexible cloud infrastructure. The company offers up to $100,000 to startups to deploy solutions built on the OVH infrastructure. To further enable this growth in India, OVH is recruiting local partners to work closely with company leveraging its international data centres in Europe and the US. Central to OVH’s operations in India is the company’s vision of a different type of cloud. Sitting at the heart of the data revolution, OVH offers an alternative solution that liberates the cloud for its customers and partners, helping them to succeed. · A Transparent cloud that functions responsibly. OVHmarket is a digital toolbox for accelerating growth. It meets the needs of entrepreneurs who wish to harness the power of digital technology to develop their business. This universe includes a range of web, telecom and cloud solutions that are quick to implement, simple to use, competitively priced and supported by local OVH partners. OVHspirit includes all the infrastructures you need to build a cloud platform. Infrastructure, hardware and network enthusiasts who want to build a cloud platform for themselves or their customers can harness the power of a scalable, multi-local cloud infrastructure that is based on cutting-edge technologies designed for specific needs, and offers unbeatable value for money. OVHstack is a public cloud platform based on open standards. It is aimed at followers of the cloud-ready approach who need to develop scalable applications in the cloud. They get a public cloud that is deployed globally, yet integrates easily into their ecosystem and remains reversible. OVHenterprise is an alternative cloud that powers successful digital transformation. This universe is aimed at decision-makers who want to achieve their strategic objectives using an alternative cloud provider. They retain control of their data by using a hybrid cloud based on both the public and private clouds offered by OVH, as well as any other clouds available on the market. 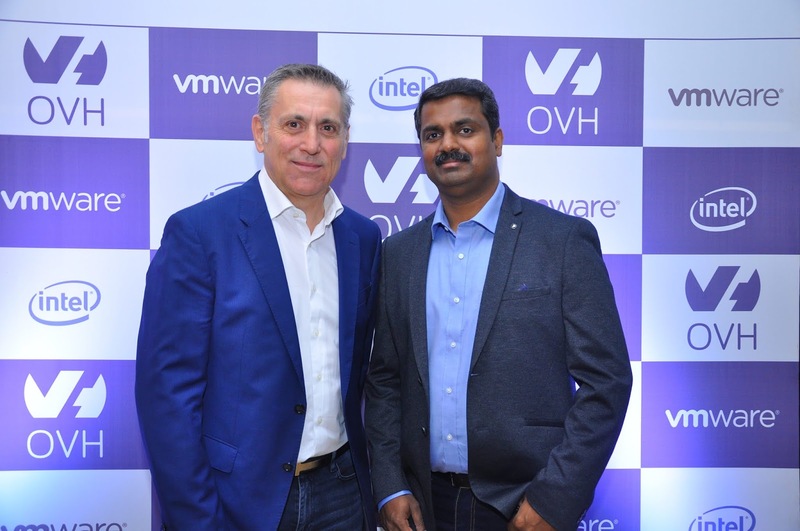 OVH continues to extend its longstanding global partnerships with VMware and Intel as it expands its business in India. VMware and OVH have built a solid partnership over the past decade spanning engineering, marketing, sales and support. Boasting VMware Cloud Verified status, and with 7 Partner of the Year awards over 9 years, OVH collaborates closely with VMware to deliver an innovative but affordable Private Cloud based on the full VMware SDDC stack. Through OVH’s acquisition of VMware vCloud Air last year, customers can now also benefit from higher network performance and increased workload mobility through OVH’s global network. Intel helped OVH design its vast range of servers for fifteen years. With this collaboration OVH is able to deliver hardware that fits a variety of needs and usages for its customers, with the best performance possible. OVH has also been able to innovate by incorporating some of Intel’s latest technologies such as Intel Xeon Scalable Processors and 3D NAND Solid State Drives. More recently OVH also incorporated Intel Optane DC SSD in our high-end servers and VMware vSAN hosts.